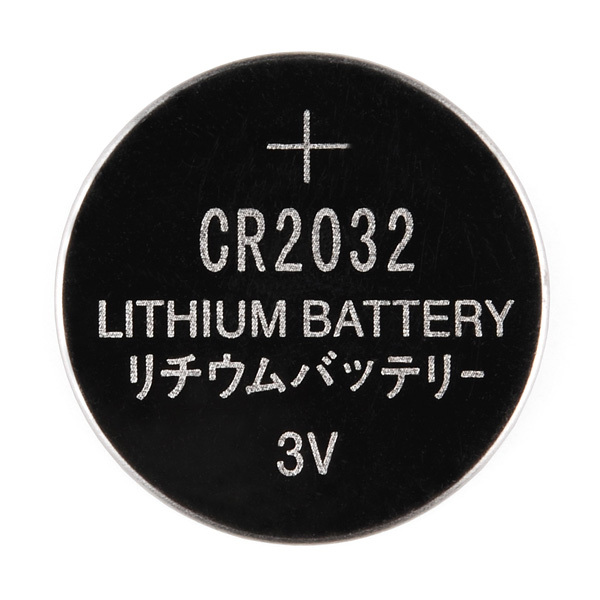 CR2032 Lithium metal 3V 250mAh button cell battery. Great for powering low power processors or blink an LED for weeks at a time. It's NOT LI-ION. It's Li-Mn !!! The USPS considers these to be hazardous materials, digikey only allows shipping via UPS/Fedex. Are you able to get around this somehow? Unfortunately, we are also not allowed to ship batteries using USPS. We do still ship via UPS and FedEx however. 622.51 Primary Lithium (Non-Rechargeable) Cells and Batteries Small consumer-type primary lithium cells or batteries (lithium metal or lithium alloy) like those used to power cameras and flashlights are mailable in a single shipment with the following restrictions: The batteries must be installed in the equipment being shipped. 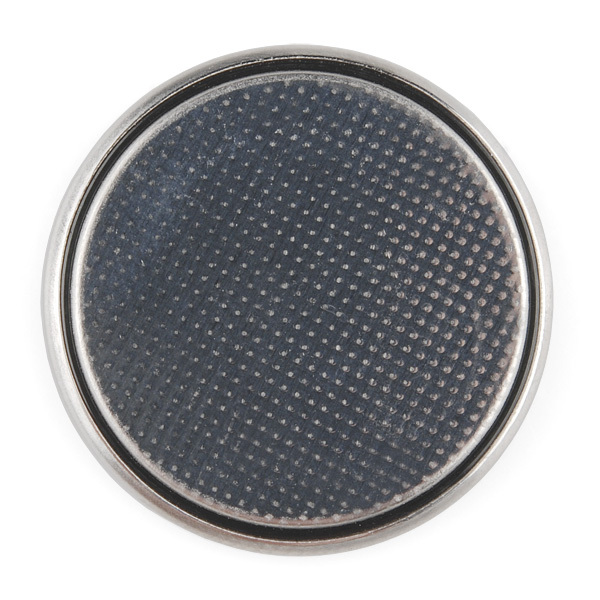 Each shipment may contain a maximum of four lithium cells or two lithium batteries. The lithium content must not exceed 1 gram (g) per cell. 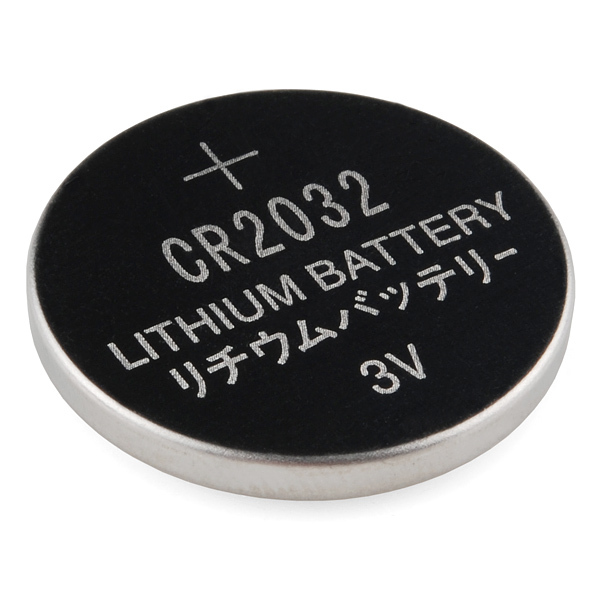 The total aggregate lithium content must not exceed 2 g per battery. The batteries installed in the equipment must be protected from damage and short circuit. The equipment must be equipped with an effective means of preventing it from being turned on or activated. The equipment must be contained in a strong sealed package and cushioned to prevent movement or damage. I wish you would stop using quarters for size reference in your photos. Not everyone outside the US knows how large a quarter is. What's wrong with rulers? 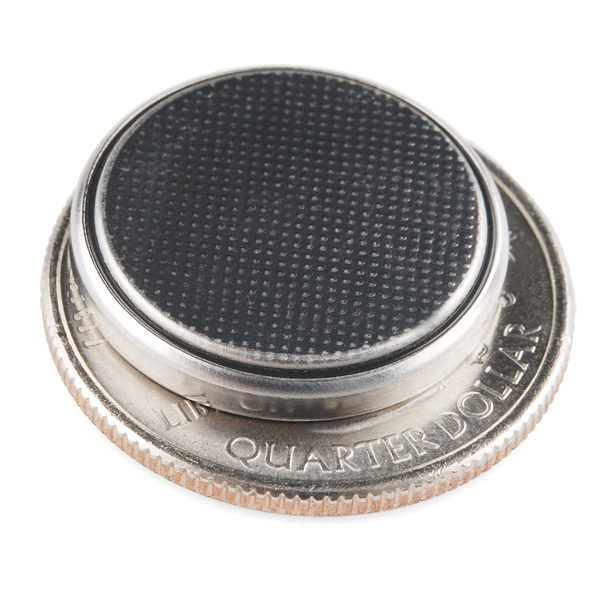 A quarter is a slightly larger than a 20mm coin cell. Hope this helps. Don't know if I just got a bad batch. 4 out of the 6 that I ordered were already half discharged the first time I used them. Email techsupport@sparkfun. They should be able to help you out with replacements. Sorry about that! is there a datasheet available? do they have a peak current we should stay under? 50mA? any rule-of-thumb we might be able to use if one is not available? How would I use more than one of these in a circuit? Can I stack them? How long could this run the pro mini 3.3V without anything attached or sending it in to any sleep modes? I'd guess 15-25 hours. Be sure to bypass the 3.3V regulator on the Mini, and run it directly off the 3V battery (the ATmega 328 will run down to 1.8V). Anyone can provide the protection circuit for charging and discharging this Li-ion? One battery weighs 0.0062lbs or 2.81 grams.